Are We Sequestering Ourselves to Death? The United States plans "in the next several weeks" to issue its final policy on how it will consider future grant requests for research intended to produce more virulent or communicable versions of avian influenza, National Institutes of Health leaders said on Friday. More than three dozen scientists this week announced they would end a voluntary moratorium on studies to produce more transmissible H5N1 virus strains, but U.S. funding recipients have agreed not to resume such experiments until the framework is ready, says a joint statement from NIH Director Francis Collins and Anthony Fauci, head of the agency's National Institute of Allergy and Infectious Diseases. The global pause took effect last January after bioterrorism fears prompted a U.S. advisory panel to recommend certain data from two studies that genetically modified the H5N1 virus to increase its transmissibility between mammals. The biosecurity board later reversed its finding, paving the way for full publication of the findings; a number of biosecurity experts, though, continued to air concerns that future experimentation could become the starting point for a deadly human pandemic initiated either unintentionally or by design. The Health and Human Services Department responded to those fears in part by preparing aproposal to subject federal grant requests for "gain-of-function" avian influenza studies to special evaluation, but many participants at an international conference last month suggested the framework would apply to an unacceptably wide array of research that could produce biodefense benefits. University of Wisconsin (Madison) scientist Yoshihiro Kawaoka, who led one of the two controversial studies, suggested limiting the policy to research seeking to increase the agent's airborne transmissibility. 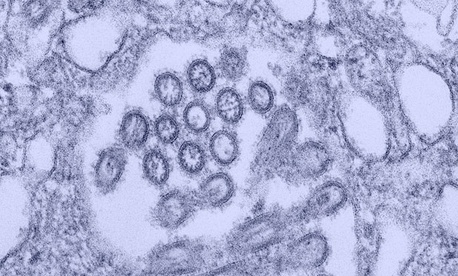 Collins and Fauci on Friday said the framework would address "funding decisions regarding research that might increase mammalian transmission of [highly pathogenic] H5N1 viruses by respiratory droplets." However, no NIH official was available by press time to confirm whether the announcement reflected plans to narrow the scope of the proposed policy. A number of participants at the December meeting criticized what they considered to be ambiguities in certain standards laid out by the draft plan for determining what avian flu investigations would qualify for financial support from Health and Human Services. In one area of concern, detractors said it was unclear what "evidence" the government would require to show that a modified avian flu virus could emerge in the environment through natural selection in the "foreseeable future." Advocates of laboratory tweaks to the H5N1 genome contend such alterations are necessary to prepare against dangerous variations of the virus potentially emerging in nature. Federal officials have extended the public comment period for the draft policy through Jan. 31, scientists said in a Wednesday conference call with journalists. Collins and Fauci commended flu scientists around the world "for the spirit in which they instituted this extended 'pause' on their work, which has provided time for thoughtful consideration of its implications." The moratorium was initially intended to expire after 60 days. The funding proposal under development would only address research aimed at augmenting H5N1 viruses. A policy announced last year addresses funding of research involving 15 "high consequence" biological agents. The National Institutes of Health is also preparing a declaration of "roles and responsibilities" of the U.S. government, as well as scientists and sponsoring institutions, in overseeing sensitive biological research involving other pathogens.